Chameleons are fascinating creatures. And weird, in a nice way. Kids are fond of weird stuff. Here's a small, easy to understand basic chameleon facts page complete with some resources and videos (oh and cute Chameleons pics too!). So next time your little boy or girl ask "What is a Chameleon?" you'll know where to start. Chameleons are Old World lizards with prehensile tails. They are best known for their coloring, which is sometimes determined by changes in light or temperature, fear, aggression and defeat or victory in battle. The chameleon catches its prey, mostly insects, with its long tongue, which can shoot out extremely fast. The muscular tongue is usually curled around the tongue bone, but when the muscles contract and then relax, the tongue shoots out of the mouth under pressure and catches insects on its split tongue. 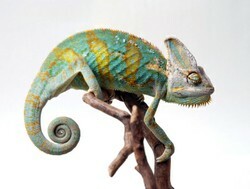 The name 'chameleon' is given to lizards of the family Chamaeleonidae. They are small to medium sized reptiles, living mainly in Africa and the island of Madagascar. Chameleons are noted for their changes in color; this is apparently related to environmental temperatures and other external stimuli. The ability to change color allows the animal to send signals and protect itself. When the chameleon become excited due to danger for example it turns its color on. The color change is made possible by the existence of skin cells that contain pigment granules of red, black and yellow (chromatophores). The pigments are contained in star-shaped color cells whose branches expand when the animal is stimulated. The pigments diffuse and become visible, thus creating the col­or change. When the cells contract, the pigments concentrate and appear as small, indefinite spots of color. The chameleon has a flat-sided body with a long prehensile tail and a prehensile tongue, which can be extended to almost the length of the animal and is used to catch insects, which form the chameleon's diet. The large eyes of a chameleon can move independently of each other. Each foot has five toes, two opposite the other three, which, along with the tail, give the animal a very efficient grip in its arboreal habitat. Most chameleons are oviparous; the female lays eggs in a hollow nest in the ground, where they are incubated by the ground heat. Depending on the available warmth, incubation may take 4 to 10 months. A great resource for teachers!Read and Wonder books tell stories, take children on adventures, and reveal how big and WONDER-full the natural world really is. Lovely pictures and interesting facts about chameleons, I really enjoyed this page. What fascinating creatures they are! I have always been fascinated by these wonderful reptiles. Now I know so much more about them! Thank you!